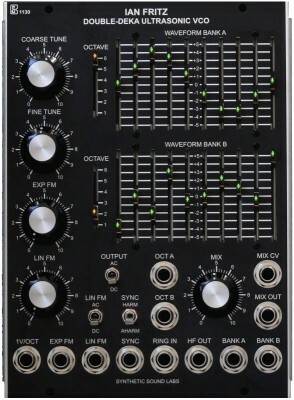 The SSL 1310 Voltage Controlled Digital Delay is a unique single width 5U/MU module for producing short to medium audio delays. For shorter delays, short room like slap-backs are killer. At medium delays, you can emulate vintage tape echos. You can even force the module for longer delays, but digital quantizing noise becomes audible – but who’s to say what’s musical and what’s not? It’s based on the ubiquitous Princeton Technologies PT2399 delay chip which is used in countless effects pedals. The really cool part is that delay times are voltage controllable, allowing everything from a little chorusing effect to a grinding, gurgling mass hysteria. Continuous control of delay from ~30ms to 0.5 seconds. Longer delays possible with greater noise. Continuous control of dry to wet signals from 0% to 100%. Continuous control of external control voltage from 0% to way more than you'll ever need! Accepts wide range of modulation voltages with high sensitivity. Nominally 10V PP, but can be overdriven. +15V @ 35ma, -15V @ 8ma, Synthesizers.com 6 pin Molex standard.